One of the busiest points on Pacific Systems is the Bay Shore trainyard five miles "down the peninsula" from San Francisco, according to figures on the number of cars handled during the month of October, when a total of 41,918 fright cars were handled in these yards. All freight destined for San Francisco reaches Bay Shore yards where it is checked and the cars switched to various "drags" destined to different points in San Francisco. All outbound freight trains, likewise, are made up at Bayshore. Cars for the various freight trains scheduled to leave Bay Shore are sent to this point from from various points in San Francisco where they are checked and made up. The immense size of the Bay Shore yards can be realized from the fact that there are 25 outbound tracks and 39 inbound tracks, representing a total of 42.5 miles of trackage. In addition to handling the inbound and outbound freight traffic the Bay Shore yards also handle the daily switching of the 21 repair tracks at the Bay Shore repair shops, as well as of the various spur tracks of private industries in the Bay Shore district. For the convenience and efficiency in the handling of freight cars the Bay Shore train yard is second to none west of Chicago and possibly in the United States. 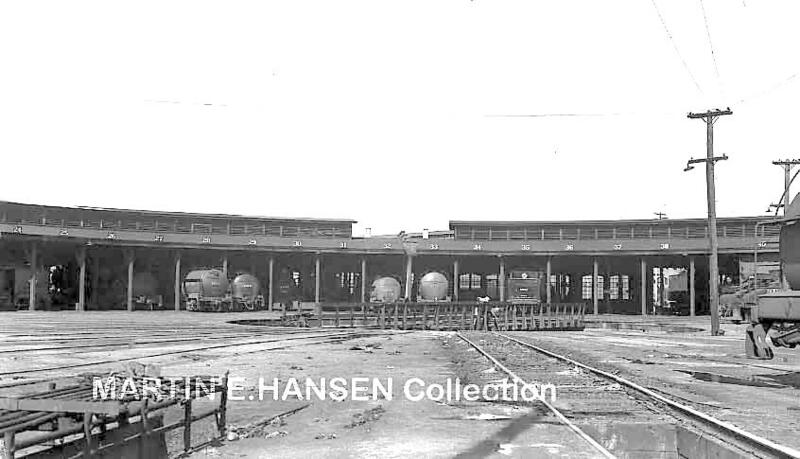 The following figures show the amount of freight business handled at Bay Shore during October, 1921: Cars received from the Western Division, 5324; cars received from the Coast Division, 3982; cars received from South San Francisco, 1602, cars delivered to the Western Division, 4839, cars delivered to the Coast Division, 4488, cars delivered to South San Francisco, 1258, cars sent to San Francisco in drags, 10,240, cars received from San Francisco, 10,185. Total freight cars handed through yard office Bay Shore 41,918. Total number of Switch engines operated in the yard per month, 422. The work of the bay Shore yards is handled smoothly and efficiently under the immediate supervision of M. E. Keeney, yardmaster. The yards are under the jurisdiction of J. D. Brennan, terminal trainmaster, whose headquarters are in San Francisco. Many of the men at Bay Shore yards have had long service with their Company and though their co-operation with the younger men mistakes are kept to a minimum. J.E. Martin, chief clerk, has had 16 years experience in the yard office, E.W. Small, clerk, has had 25 years service, and E. Alberts, another clerk, has had 13 years experience. The above text from the January 1922 SP Bulletin gives an image of the sheer magnitude of operations at Bayshore Yard. In 1941 The 90-foot turntable was replaced with a longer 110-foot model, apparently with hardware salvaged from a bridge on the the recently torn up line from Los Gatos to Felton. The roundhouse plans at this time show a 40 stall roundhouse. Below, the Bayshore Machine & Erecting Shops crew pose for a group photo in June of 1949.